Color key proof (minus the copper foil for author and title) of the unpublished first cover of Finding Moon by Tony Hillerman. Design and illustration by Peter Thorpe. 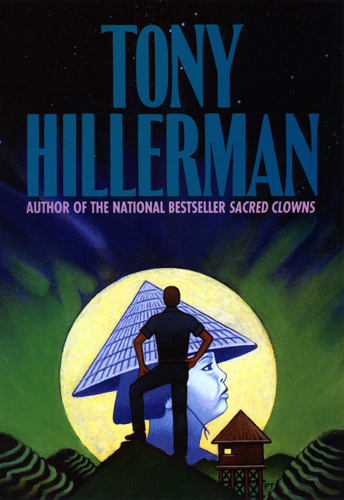 Cover of the 1995 HarperCollins hardcover first edition of Finding Moon by Tony Hillerman. Design and illustration by Peter Thorpe. Tony Hillerman's Finding Moon was released by HarperCollins in 1995. Although not a Navajo mystery, the first version of the cover was rejected as too different from the Hillerman Navajo mystery covers. The final version used Native Cambodian elements in the same vein as the Southwest Native American elements that are used for Hillerman's Navajo mysteries. 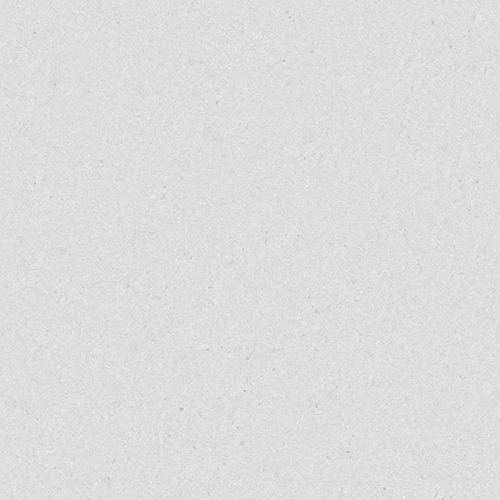 Design Director: Joseph Montebello. Design and illustration: Peter Thorpe. 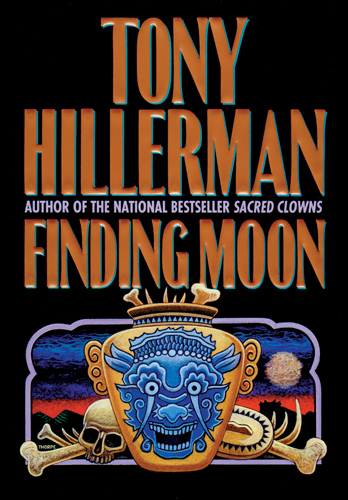 In his autobiography, Seldom Disappointed (HarperCollins, 2001), Tony Hillerman writes about the first version of the cover for Finding Moon: "Finding Moon (is) closest to my heart, but not to those of editor, publisher, and many of my readers. Peter Thorpe, the talented jacket designer of my Navajo police books, did a beauty for this one - painting a moon rising over Cambodian mountains with the figure of a man outlined against its face. I got an early look and endorsed it, whereupon it was redesigned to fit more into the pattern of my previous books - the sort of development that reminds writers of their place in the publishing world."